I was VERY excited about this trip from the moment I knew I could book it. The St. Regis Punta Mita is consistently rated as one of the top resorts in Mexico and I had never traveled to the Riviera Nayarit area of the country, so it seemed like an obvious choice to “kill a few birds with one stone” (I promise- no birds were harmed during our trip!) I’d travel to a new destination, experience a resort I have always wanted to visit, check out a highly rated luxury property for you, my clients, and celebrate my wedding anniversary on the opposite end of the Pacific Ocean from where we were married. We decided to start off our trip right with business class airfare on USAirways (aka American). It was a very short 2 hour flight from Phoenix, but it was our anniversary and we wanted to splurge. When we landed, a bus escorted us to the main terminal where the customs line was significantly less than what we experienced in Cancun. We were through customs in about ten minutes. Once through customs, we were advised by the resort to walk through the “timeshare sales” area as quickly as we could to the main exit. A driver holding a St. Regis sign greeted us, whisked away our luggage while we got money from an ATM, and then led us to our private Lincoln Navigator transfer. The transfer from Puerto Vallarta to the resort is about 45 minutes, so I do recommend the private transfer that goes directly to the resort. There is plenty of room to sit back and relax and you are given cold bottles of water to enjoy during the drive. 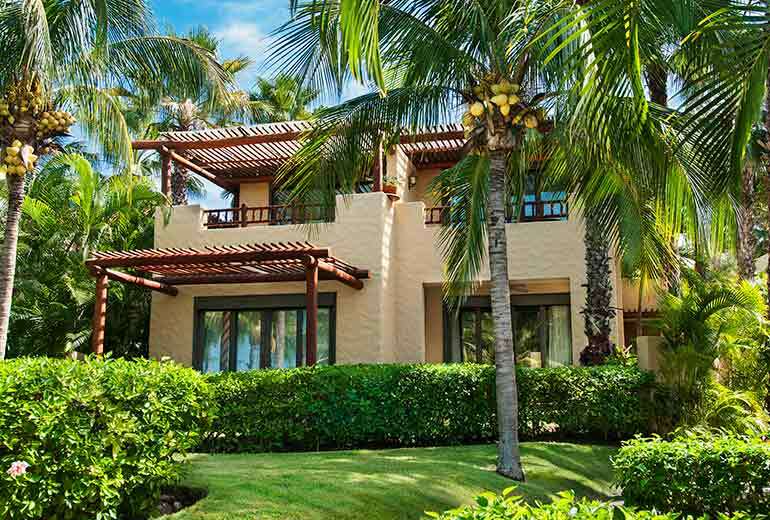 Immediately upon arrival into Punta de Mita, it was apparent that this is a secluded area focused on luxury. The entire area is gated and includes private homes, golf courses, and the Four Seasons resort (more on the Four Seasons later). The entrance to the St. Regis property is simple, yet comes off as very upscale and grand. My first impression of the grounds was that they were meticulous- and they are! The vegetation around the property is very lush and colorful, with various types of trees and tropical plants. I remained in awe of the grounds and how well they were maintained during the entire stay. As we pulled up to the reception area, we saw a gathering of staff. 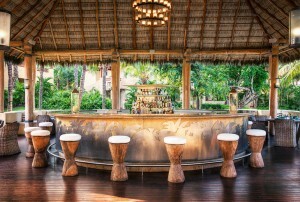 We were helped out of the SUV, greeted with margaritas and iced tea, and whisked off to a sitting area overlooking the Areca adult pool. The view looking out over the pool to the ocean is absolutely breathtaking. After a personalized check in (and a delicious margarita), we were led to a golf cart, which escorted us to our room. Our room, 7303, is a second floor deluxe ocean view suite looking out over the Sea Breeze pool area and the beach. The room buildings are only two stories, so this particular room was on the top floor. We found this location to be ideal for us, as the nearby Sea Breeze bar featured a nice Happy Hour from 6pm-7pm every evening and the Sea Breeze restaurant just across from the bar could also accommodate us for breakfast and dinner every day. About that Happy Hour- it’s two for one top shelf margaritas, beers, and get this- Veuve Clicquot champagne. Veuve Clicquot is also offered complimentary as part of the Friday evening champagne ritual. Anyway, the room also had a lovely sunset view and for the majority of our stay, I don’t believe we had any neighbors. So, it was very quiet and private. However, the room was about a 5 minute walk to the adult pool, Areca, where we spent our days lazing and grazing. Five minutes doesn’t sound like a long walk, but it is when it’s hot and extremely humid! The Areca pool is a large area with two pools and a spa. The larger pool and spa is just steps from the beach. The second pool is just above the larger pool, built into the hillside. Both pools have attendants who bend over backwards to take care of you, whether it’s to bring you a cold beer, serve lunch, wipe off your smudged sunglasses, provide Evian spritzes, or keep the complimentary water bottles they provide cold with fresh ice. The service was impeccable and the food was delicious. Antonio, one of the attendants, was there every day during our stay and made sure all of our needs were met. The only other “activity” we did was booking a couples massage at the onsite Remede Spa. The spa is one of the bigger resort spas I’ve ever been to and it is very upscale. Even with a favorable exchange rate, the prices are a bit steep. Our 90 minute couples massage was over $500, including gratuity. However, all treatments are customized to your wants and needs and the spa menu is quite extensive. As I mentioned previously, we spent most of our nights dining at the Sea Breeze restaurant. There is a more upscale restaurant on the property, Carolina, but since I am not a foodie, there was nothing on the Carolina menu that appealed to me. However, it is worth checking out if you are not picky. At Sea Breeze, I ate the same meal pretty much every night- a filet mignon with a side of some form of potatoes- and it was delicious! However, on the night of our anniversary, we ventured over to the Four Seasons Resort and had dinner at Bahia. Bahia is set along the edge of the beach over looking the Bay of Banderas. It is a lovely setting, but the restaurant was extremely loud and crowded, not to mention full of children. While it did not make for a romantic setting, the food was excellent. I enjoyed a filet mignon with a side of parmesan truffle French fries (surprise!) with a chicken satay appetizer. As for breakfast, Sea Breeze has an amazing breakfast buffet. You can choose the order a la carte, but the buffet is extensive with various pastries, an omelet bar, a quesadilla bar, and various other stations, including Mexican specialties and various granolas. We chose to do the buffet every day and were never bored of the options. A few other additional points about the St. Regis: The St. Regis offers butler service, where you have a personal concierge. This is included in the rate and your butlers (one for morning and one for night) are available at your beck and call. After we were escorted to our room, our butler arrived to set the tone for our stay. He immediately made reservations for us at the spa and at Bahia. Your butler can also deliver complimentary coffee and/or tea at any time of the day. Just one phone call and 20 minutes later, you have steaming hot beverages with mini-cakes. Also included in your rate is a 10% service charge. The butlers, along with the regular staff, do not expect gratuity because of this. However, we upped our gratuity to 20% for the outstanding service and also provided an extra tip to our butler for quickly arranging our reservations. As butlers do not provide you with receipts for their service, I recommend to have extra cash on hand to recognize exception service. The airport transfers are also paid directly to the driver, so I paid for the transfer with a credit card, but tipped in cash. 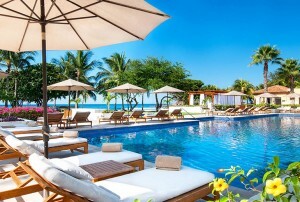 Overall, we were very pleased with our stay at the St. Regis and felt the Punta Mita area is exceptionally gorgeous. We were most impressed with the level of detail to put into the service and the personable nature of the staff. We travel extensively to luxury properties and feel that the service is on par with resorts that have room rates double what the St. Regis charges (which, by the way, is a lot!) If we do return to this area, we’ll most likely only stay for a long weekend, but I do recommend this property for honeymooners or couples who wish to celebrate an anniversary but do not want to travel very far from home. For an extra splurge, my recommendation is to consider booking a one bedroom suite, which sits at the edge of the beach and has a plunge pool. While the pool is not entirely private, the views from the room and the pool look directly out to the water and sunsets. Any specific questions about this property, please contact me!